The Keebler elves popularized Pecan Sandies but I find the ones my friend Lauren made to be better... simply because they are homemade with a touch of love. 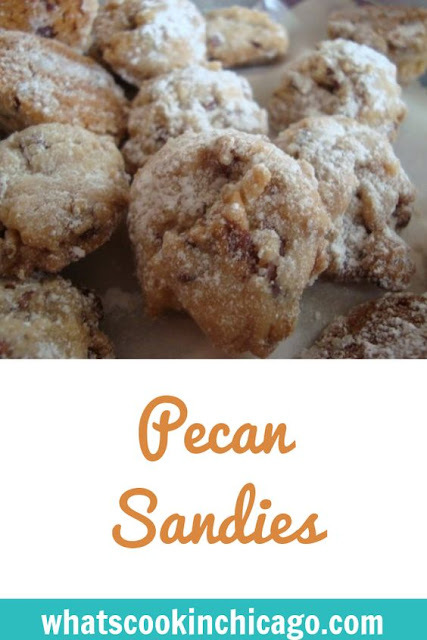 These are a great recipe and one that's easy to make! In a large bowl, cream together the margarine, vegetable oil, 1 cup white sugar and confectioners' sugar until smooth. Beat in the eggs one at a time, then stir in the vanilla. Combine the flour, baking soda, cream of tartar and salt; stir into the creamed mixture. Mix in the pecans. Roll dough into 1 inch balls and roll each ball in remaining white sugar. Place the cookies 2 inches apart onto ungreased cookie sheets. Bake for 10 to 12 minutes in the preheated oven, or until the edges are golden. Remove from cookie sheets to cool on wire racks.